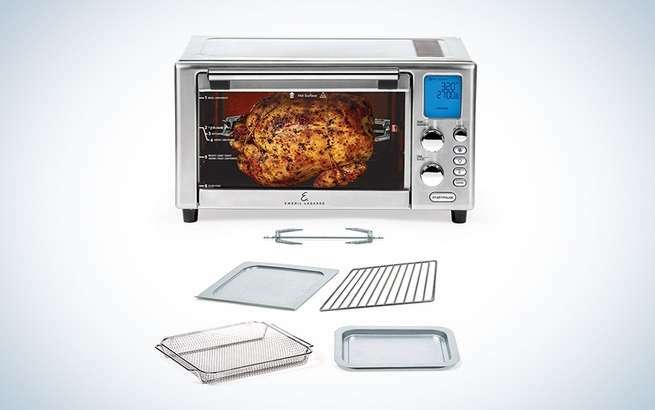 Emeril Lagasse Power Air Fryer 360’s five heating elements bake, toast, air fry, and dehydrate—all the while looking like a fancy toaster oven. The 19 x 15 x 9.5-inch device can fit a 12-inch round pizza or a chicken up to 10 pounds. There are 12 preset cooking options, but if none of those suit, you can always choose the temperature and time manually. The cooker comes with a crisper tray, pizza rack, rotisserie spit, baking pan, drip tray, and recipe booklet. All the racks are dishwasher safe, but make sure you let the device cool down before cleaning the inside. Once cool, use a nonabrasive cleaner and soft sponge. $220.